Eurosceptic 'earthquake' rocks EU Jump to media player Eurosceptic and far-right parties seize ground in elections to the European parliament, in what France's PM calls a "political earthquake". Lib Dems disagree over Clegg Jump to media player Chief Secretary to the Treasury Danny Alexander has rejected calls from senior Lib Dem party members for Nick Clegg to stand down. UK/EU relationship 'can be fixed' Jump to media player Foreign Secretary William Hague says that the Conservatives are best placed to fix Britain's relationship with the EU, despite a surge in support for UKIP. How political map has been redrawn Jump to media player With most of the results now in for the European Parliament election, Jeremy Vine takes a look at how the parties stand in Great Britain. 'We don't want to be a German colony' Jump to media player A Spanish party which is just four months old has garnered enough support to take almost 8% of the vote - and five seats in the European Parliament. Pro-Europe Renzi wins in Italy Jump to media player Italy's centre-left Prime Minister Matteo Renzi has won a substantial victory in the European elections - one of the few positive results for pro-European parties. Greens predict political change Jump to media player The leader of the Green Party has predicted a period of "political change" following the election for seats in the European Parliament. 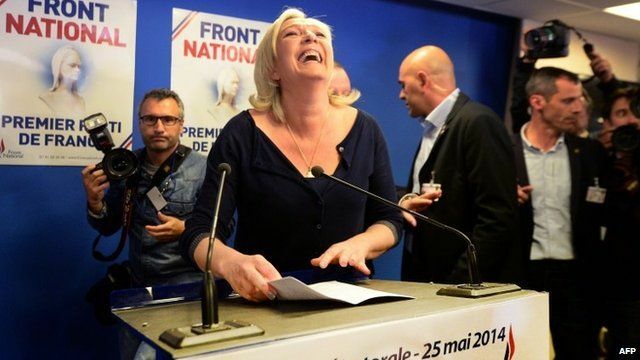 Le Pen: 'The people have spoken' Jump to media player The leader of France's National Front party welcomes exit polls which suggest they have come first in the country's elections to the European Parliament. Farage hails 'extraordinary' result Jump to media player UKIP leader Nigel Farage has again ruled out a coalition of Euro-sceptic parties, following elections to the European Parliament. Italy's Five Star anger against EU Jump to media player An Italian anti-establishment political group called the Five Star Movement is turning its attention against Europe. While the French National Front and UK Independence Party both headed for first place, the three big centrist blocs in parliament all lost seats. But EU supporters will be pleased that election turnout was slightly higher.